I have always been a breakfast person, I wake up and I’m hungry. When trying to cut the carbs, you every now and then have to think twice what to eat for breakfast. Often I just have a baked egg or some yoghurt with homemade granola but every now and then I miss the easygoing of just having a sandwich. Unfortunately I’m in general not very found of low carb bread, they often taste too much egg, too much fiber husk or not at al bread. Luckily, thanks to the Swedish chef Birgitta Höglund and her paleo blog I have now found a bread I like. The sour taste from the apple vinegar and the walnuts really reminds a bit about a sourdough bread. Below I have used the recipe from Birgitta and added a few changes that suited me better. Please click on the link to come to the original recipe! To go with the bread, I have prepared a bitter orange marmalade with cinnamon and saffron. The marmalade is prepared without any preservatives or sugar meaning that it has a very limited lifetime in the refrigerator (+/- 2 days). I enjoyed the marmalade with clotted cream but Philadelphia cheese or just butter would of course work perfect as well! On my other sandwich I simply just added sliced avocado, some red cabbage, spring unions, salt and pepper and a splash of good olive oil on top. 1. Preheat the oven to 300ºF (150ºC). Grease a loaf tin (1 ½ quarts) thoroughly. Ground the fennel seeds. 2. Crush the walnuts coarsely with a mortar and pestle, or chop them with a knife. 3. Melt the butter and mix together with the grounded fennel and let it cool. In a bowl, mix all the dry ingredients. 5. Add the dry ingredients with the mixer on low-speed. Mix well. 7. Cover the pan with aluminum foil and bake in the lower part of the oven for 45 minutes. 8. Remove the foil and bake the dough for another 45 minutes. Let the bread cool a little in the pan, and then unmold it on to a rack. Let it cool on the rack without covering it so it stays crusty. 1 tsp of coconut sugar ( I like the marmalade bitter but ask your own tastebuds and conscious), you could also use mulberries or soaked gojiberries to sweeten your marmalade if preferred. 1. Clean the orange well and cover the whole orange with water and cook for about 2 hours on medium heat. Let it cool off out of the water and cut then the orange in 4 pieces. Take out any seeds and if there are any big visible white membranes in the orange. This could also prepared the day before you make the marmalade. 2. Add the 4 pieces of the complete orange (including the peel) to your mixer bowl. Add the other ingredients (part from the cinnamon sticks) to it. Let the mixer run until you have a rough marmalade texture. 3. Pour over the marmalade in a pan. Add the cinnamon sticks. 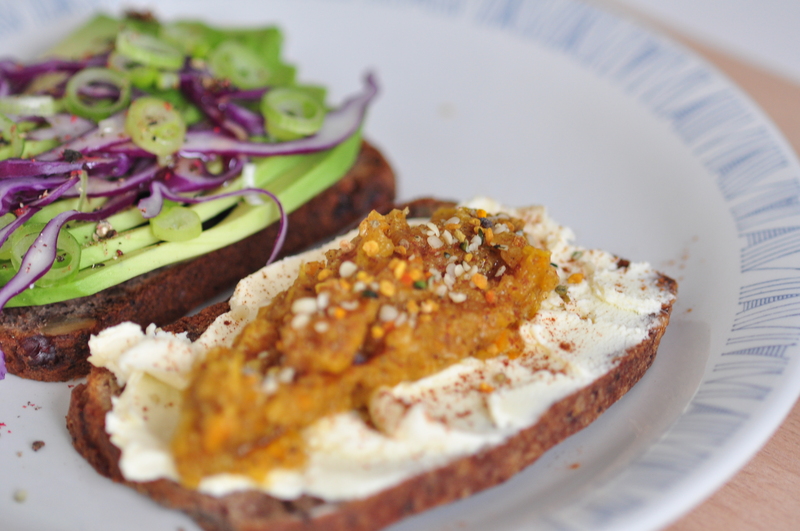 Enjoy the marmalade on your sandwich, I sprinkled some hemp seeds and bee pollen on top.